ETA: I just found the Birthday Challenge over on the Moxie Fab World, so I am linking up!! Hello my lovely readers! Truly, it’s been too long since I managed to post with any real regularity. The next couple of weeks are going to be nuts, and then I hope to get back to normal. Bear with me? 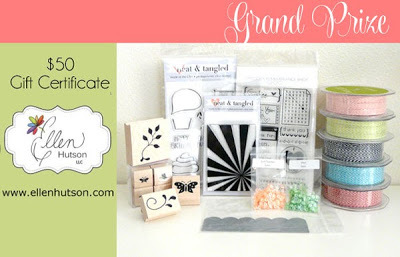 I am popping in today for the latest 10 Minute Craft Dash. But this isn’t just any new colour palette over on Paulina’s blog… it’s actually a huge celebration! 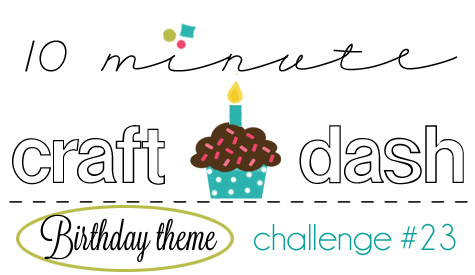 Today, the 10 Minute Craft Dash is celebrating it’s first birthday! To celebrate, we are throwing a little party, and we invited a whole cast of talented ladies to celebrate with us, Blog Hop style. If you came here by way of Daniela Dobson, then you’re on the right track. If you’ve happened upon me by chance, then head on over to Paulina’s blog to find out all the details, and hop along with us! As you saw, instead of colours this week, we’re focusing on a Birthday Theme (was there any other choice? )… so I went to my Pinboards, and found this beauty that I decided I wanted to try and CASE in 10 minutes or less – ambitious, no? I did some good prep – dug through my scrap bin and had a ton of coordinating scraps sitting on my desk before I started. Then, I moved faster than ever before. I won’t lie… I kind of impressed myself. Is it wrong to admit that? If you look, the design itself is actually pretty simple. I just had to be organized before I started, and then move fast. I love how it turned out, and I am so glad I didn’t veer much from the original design, because it was so perfect how it was. I finished this in 8 minutes and 28 seconds. I am pretty sure it’s time for me to figure out the video set up so that I can prove to you that I am not fibbing about my 10 minute cards! And don’t forget to hop along for some incredible inspiration – there is such an amazing list of designers joining us this time around! That’s it for me, so off you go, and see what the amazing Amy Tsuruta has for you! Can't believe you made this card in under 10 minutes! It is beautiful!! WOW – fabulous X 1000 card, and the fact you created this beauty in under 10 minutes amps up my 'awe' response! Deciding what to create alone would have taken me 10 X 10 minutes! Stunning! Wow, your card is beautiful. Puts Hallmark to shame. What a sweet and pretty card – if I was smart enough to come up with your layout I wouldn't have changed a thing. Great Job, love your card! What an elegant 10-minute card. I love it. I think yours is even better than the original!! I love the colours and the little bloom – gorgeous! And yes, its time you made a video – I'd love to see it! So pretty and soft! LOVE all those sweet banners!!! Very pretty card. The flowers and the banners are terrific. Absolutely beautiful card. Sure doesn't look like it took under 10. Thank you for sharing this project. That is a great design, I loe the use of the banners. Your card is PERFECTION! So pretty! Ohh my gosh…this is so soft and beautiful…LOVE it! WOW. Your card is the most beautiful one I've seen today. Absolutely gorgeous! You impressed me too! Great card, love the embossing, so subtle. WOw-less than 10 minutes and beautiful! I am impressed. Awe what a delicate and pretty card! It reminds me of something I might send to my great grandma. I love it! Sweet. too late but perfect for a mother's day! !next year! This is stunning, Meredith! It's so beautiful! Gorgeous card!!! Love the banners and the soft pretty colors. TFS! your card is beautiful!! love the flower. OMG! I am in awe of you……….that is a beautiful card in such a short time. What a BEAUTIFUL card!! I just love all the little details!! Thanks so much for sharing!! Love this! I live the soft tones in your card. No way…..8:28? It is beautiful! This card is so beautiful and is totally YOU. Love those patterned pennants and the sweet colors. You definitely rocked this one and there's no shame in saying you love it- I totally would! Such a sweet and pretty card! Beautiful papers and love all those pennants and the embossing! Dear Meredith, your card is so beautiful! I love its colors, the backgrounds and the flower, they all match so lovely! Love love love the multi-patterned flags on this card; just beautiful. Be impressed with yourself it is lovely. I can hardly believe you did that in such a short time. Your card is absolutely gorgeous! I love how you used up scraps!! It's gorgeous! So pretty – love the banners and the flower. Meredith, what a beauty! This is so soft and just stunning. You amaze me with the cards you can create in such a short amount of time. Beautiful card! I'm so loving the flag style embellishments! Unbelievable you were able to create such a FAZb card in under 10 minutes!! WOW! Thanks so much for sharing for this super great celebration Hop! HB to the 10-Minute Craft Dash!! Love your card Meredith it have soft and romantic colors. Lovely card thank you for sharing with us. I can't believe you had time to cut all those banners within the time limit–the card turned out really sweet. I really love the layered banner look – great idea to use those small paper scraps I can't bear to part with! I love your colors in this sweet card too. I love the layered banner and the colors you used! What a great idea for those patterened paper scraps I can't bear to part with. The flower is so sweet as well, beautiful card. I like the way you layered the flags and tucked them under the ribbon. Very elegant – it would be pretty as a wedding card too. Thanks for sharing. What a classic looking card, love it! Love this card! So pretty and delicate! Would be great for a wedding card also. This is such a soft and sweet card….I could have never completed this is 1/2 day, let alone 10 min…beautiful. Very pretty card. Love the colors pennants and flowers. You should be impressed with yourself– this card is lovely and I cant' believe you made it in under 10 minutes! You should be impressed…this card is lovely and the fact you did it in just over 8 minutes is amazing. Elegant and playful at the same time. Beautiful Card. Nice sophiscated card. Love the softness of the pp's that you have used. your card is very pretty and delicate! Good job – love all the banners and gold print. Very pretty card…so soft and serene feeling…fabulous! Love this sweet card and the soft colors! This is just beautiful!! Non. Lovely job with it! 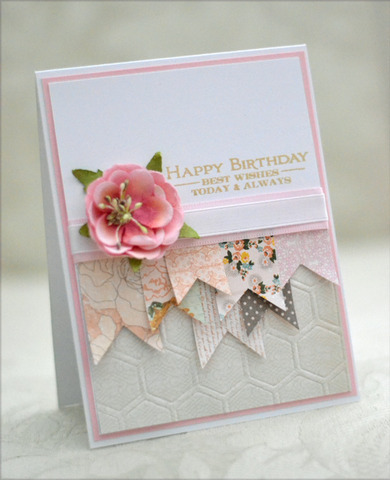 What a pretty card – love the banners and soft colors. What a gorgeous card! Love all if the banners. You did an awesome job. Gorgeous, you have bettered your pin. Love the colors you chose for your card! So pretty! You have every right to be impressed with yourself! This card is so lovely. I am impressed myself! Love the soft colors on your card. Such a pretty card, beautiful colours! Gorgeous!!! I'll be scrap lifting it for sure! This is gorgeous–love the flower, flags and embossed background. Phew! Gorgeous, gorgeous card and bravo on getting it done under 10 minutes. In one word — gorgeous! And in another, — breath-taking! Beautiful! I love this card–just my favorite style–very classy and elegant and gorgeous! Wow!! Gorgeous card!! I love the bits of DSP for the flags, and the soft, beautiful colors you used!! And that flower just added the finishing touch!! That is simply amazing! I cannot imagine making something that beautiful in less than ten minutes. Such a pretty card. Love all the banners. Beautiful colors. Love your card, very girly!! Beautiful card. Can't believe its a 10 minute card! You must work fast. I'm impressed. I'd never be organized enough, but would love to try. I am amazed you were able to do that in the time that you did! Those banners wouldve taken me time! I love this card! Looks great!! I love all the banners!! Beautiful card! Love everything about it. Thanks for sharing! Great CASE – that I will also CASE. This layout has so many options. Such a lovely card! I'm amazed at how fast you were able to finish. Beautiful! Video please… not because I don't trust you, but just because I would love to see your creative process. You have an amazing style! VERY impressive card made under NINE minutes!! Very pretty card. So feminine. Very nice. You are right to be impressed! That would have taken me 10 hours. Beautiful card – love the colors. SUPER card Merideth – LOVE the layered flags! This card is gorgeous! I love the layered banners. Wonderful! Beautiful card! The patterned flags are perfect! Very nice! This card is gorgeous! Definitely my taste. I think it follows the original beautifully. Such a pretty card…good job! it certainly is beautiful and i like how you layered your little banners. Beautiful! Lots of pretty layers, love those soft pinks. This card is just beautiful! So many pretty elements. A stunning card. I like it better than the original. Such a wonderful inspiration card and your CASE is so very delicate and lovely! I love the papers you used and the flower adds so much, without taking lots of time, genius! TFS! I am in awe that you created this in 10 minutes! That is crazy amazing! I love the papers and the colors! So sweet! the banners are such a cute way to use up small papers! CUTE! Seriously! This card is absolutely gorgeous – I can't believe how you did this in less than 10mins! Well done! Oh my! oh my!! This is soooo gorgeous!!! Wow I am so impressed with this card! It's just beautiful! Beautiful card. I've made similar ones but I'm sure it took me 30 minutes. Kudos to you – what a beauty in under 10 minutes. That bloom takes it over the edge. What a beautiful card! Your scraps sure made this pretty! This is a beauty for 10 mins. Wow. Lovely card. Love this beautiful feminine card! Such a pretty card! I love the soft colors! Beautiful card. I just love embossed white cardstock! Beautiful b-day! Amazing such beauty can be made so quickly! Your card is GORGEOUS!! I love the shabbiness of it!